After investigating the constitution of the nation's most-consumed coffees, we found this truth to be self-evident: all cups of Joe are not created equal. 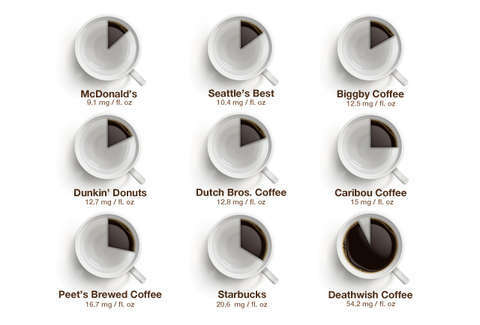 According to our super-scientific source, the Center for Science in the Public Interest (supplemented by stats from the much-less-official-sounding EnergyFiend.com), the milligrams of caffeine per ounce vary from chain to chain as wildly as the mood of someone hopped up on six cups from Mickey D's. Which happens to be the equivalent of just one cup from our champion, the Death Wish Coffee Company -- a roaster who might not give a damn about life or liberty but surely holds fast to the inalienable right to the pursuit of caffeination.